Bespoke jewellery is what we do best. Over the last 20 years, I have worked alongside 1000’s of clients, designing and making their perfect pieces of jewellery. From dramatic neckpieces & men’s jewellery, wedding & engagement rings, right through to signed and framed pictures. Myself and my two Honeybourne Jewellery colleagues, Raff & Emily, can make the entire spectrum on the premises..
For our full range, check out our ‘Bespoke Archive’.We pride ourselves on making life as easy as possible for our customer’s as we understand that it can be a daunting task placing that initial order but we feel that our years of expertise and relaxed and friendly approach will put you at ease. We feel that it is testament to our passionate approach that keeps our customers coming back time and time again. Relax, bespoke doesn’t have to be daunting! Here are some frequently asked questions answered..
“I want to propose to my partner, I think I know her style but I don’t have her exact size” This is a common issue as guessing the size and style can be an almost impossible task but relax, we have the answer!. We have lots of rings in many different styles in stock that can be bought and used for the special proposal. As long as the ring is un-worn (no problem to use it for the all important social media announcement!) the happy couple can make an appointment together where we can discuss designing and making up the real mccoy adding her design input. The original ring is then returned to us (please note, terms for this service apply, ask for more details). On some occasions, we can make a ‘mock up’ ring for the proposal using silver and semi precious stones. The final piece is then made (addressing any design ‘tweaks’ from the bride) in gold and precious stones such as Diamonds. “How long does it take to have something made” That depends on the piece. Our personalised jewellery, such as our ‘Pieces of Eight’ collections, bookmarks and keyrings, can be made as quickly as 2-3 days. More intricate, involved pieces such as engagement rings or pieces using inherited stones and gold can take between 4-8 weeks but we try to be as accommodating as is possible. If using inherited material, we often make a silver ‘mock-up’ for the customer to try before they decide on the final design at no extra cost. It’s extremely important to us that they are 100% happy with every aspect before the final piece is made. This allows our customer’s to have full input and involvement from start to finish with our guidance. “Can I just turn up at the boutique and order or do I need to make an appointment” Our shop opening hours are Mon-Sat 10am-5pm. 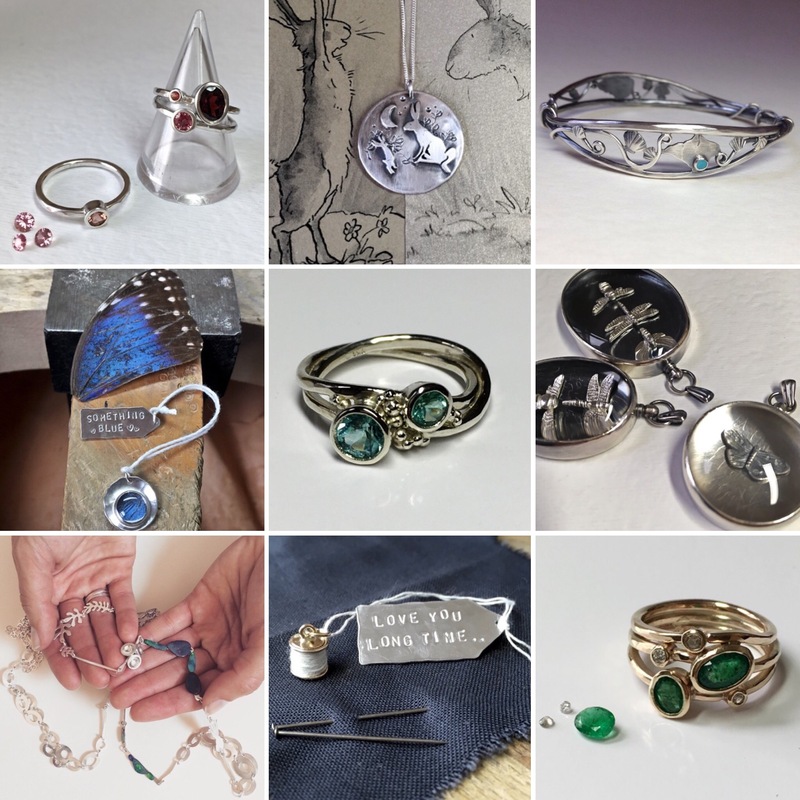 We are always happy for customers to pop in for a browse, a try on or just to gather inspiration and our team are fully trained in taking an array of commissions, such as our personalised pieces and Pieces of Eight jewellery, ‘off the peg’ enamels in different shades, advising on ring sizing etc. However, if you want to discuss more complex designs, please always phone ahead to book an appointment with me (Sophie!) or to see if I’m in the workshop as I’m not always available as very busy creating current commissions. “How much extra does it cost to have bespoke” Having something ‘bespoke’ ( handmade for you), doesn’t make it more expensive than buying ‘off the peg’. The cost depends on the materials used, silver or gold etc, and the complexity of the design and how long it may take to make. We do not charge extra for bespoke, we provide quotes before we proceed with any order and are also more than happy to work to your budget, providing ‘menu style’ options to choose from. “Help, I can’t draw, do I have to provide sketches ” No! We pride ourselves on making pieces for all, from those who have exact ideas of what they want to those who have only a tiny ‘spark’ of an idea. We can advise throughout.